RTH: When you played with Levon on Spectacle was that the only time you’d performed with him? NICK LOWE: No, we did a Ramble. I got to play with him a bit more; we did some old rock ‘n roll numbers. He’s just one of the greatest rock ‘n roll drummers. Yeah, that sounds really silly to say that, but it’s so rare to hear drummers that can play rock ‘n roll properly. I got to play some old rock ‘n roll numbers with him, and that was a real great thrill for me. RTH: Growing up, a lot of your work was the soundtrack to my teenage years: the stuff you did with the Rockpile gang, the various Stiff singles, and the albums with Elvis Costello. From that period do you have a favorite recording experience? NICK LOWE: Oh, well there are many, but the thing is you have to go for the first one that occurs to you. I would think that one of the – well, there are two, I suppose, but they’re similar, they’re both with Elvis. We used to record in a very, very funky, old studio, because it was so cheap. For a while everyone recorded hits there: “Sultans of Swing,” “Roxanne”… It was a tiny, tiny funny little place, but it had a great sound. The experience that comes to mind would be “Watching the Detectives.” We just couldn’t believe that we’d made a record like that in that room. It was almost like none of us had anything to do with it, you know, we just turned up and out came this incredible record. And I still can’t quite believe it when I hear it on the radio. Also “Alison.” We did “Alison” in the same studio. The recording of “Alison” is a rough mix. Sometimes, especially in the old days, you’d do a rough mix at the end of a session. You’d just throw up a quick rough mix and you’d take it away and listen to it. “Alison” was one of those, just a rough mix at the end of a session. We could never get anywhere close to that whenever we tried another mix. We’d mix it again and it sounded like a different song. It was a real mystery. RTH: Sticking on the production theme, on your new album, The Old Magic, and your previous 4 albums, took a real turn for you, with a natural, restrained production that works great. I was thinking, compared with your earlier, dynamic, sometimes crazy productions do you still feel there’s a common thread in your production work when you put together a record. NICK LOWE: I do, actually, yes, I do. I suppose with my advancing age I’m not quite so interested in tricks in the studio, sort of wham-bam-thank-you-m’am. But I still like a natural feel and sound, like a human being. I know that, unfortunately, the general public don’t really like records like these. They like something that sounds like it’s not going to have too many surprises. That homemade, handmade feel. Luckily, many people do like this, but I’m afraid we’re in the minority. RTH: You’ve crossed paths with Wilco a lot in the last year: you showed up with them on Austin City Limits, the “Sensitive Man” video, and you’ve got the Autumn Defense opening some shows. Is there a possibility of you doing something with Wilco in the future, like an album? NICK LOWE: Well, who knows? I certainly did make some new friends touring with them. They’re very nice fellows, really great musicians, music lovers…and their audience are very musically literate. I didn’t know how it was going to go opening for them, you know, a guy on an acoustic guitar. Their audience liked what I did. As to us doing something in the future, there are plans, vague plans. It’s all rather up in the air at the moment because we’re both touring so much. I would be very, very happy. If nothing else they’re very agreeable people just to hang around with. I’d enjoy that. RTH: I’ve read a lot of interviews with you, listened to many interviews, and everyone wants to ask about your legendary former in-laws, but I’m not sure if I’ve heard stories about your own parents. Were they musical? Did they support your early musical efforts? 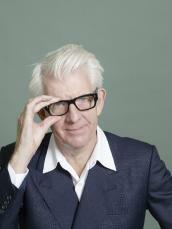 NICK LOWE: Yeah, my Mom was very instrumental in getting me interested in music when I was a kid. She was a pretty good singer, and she also taught me to play the guitar, but very rudimentary, just a couple of chords. We used to sing together and play together. She taught me to sing harmonies. We played old Lonnie Donegan stuff, who was so inspirational to my generation of musicians. In other ways she had good records: Sinatra and Nat King Cole and Peggy Lee. Show music: South Pacific, My Fair Lady, that sort of thing. I loved all that music. Also, most importantly, she had 2 – I don’t know where she got them – she had 2 Tennessee Ernie Ford records. When I heard that stuff I really thought that was special, and I still do. RTH: You’re a relatively new father; your son is 7. What kind of music dad do you think you are? Are you force-feeding him stuff? Steeling yourself for the day you come home and find him listening to Pink Floyd? NICK LOWE: Oh, there’s much worse stuff than Pink Floyd. Ah, he’s definitely musical, he definitely is. He’s got a drum kit and can catch a groove. He’s a very good singer. He listens to the stuff that me and his Mom listen to: rock ‘n roll, gospel, early ‘60s pop records. He listens to quite a wide range of stuff, actually. But he finds his own stuff, stuff he thinks is great that I can’t listen to. Real modern pop music. He loves it, and that’s good enough. Kids aren’t supposed to love all their parents’ records, but he does like the stuff we like. RTH: So as I said, I’ve grown up with your music and a cool thing that I appreciate with your career – and it’s more than just longevity – is I feel you have grown up with me. You’re still kind of setting the pace ahead of me. I can still listen to your music for guidance and comfort. I wonder if there’s an artist from your youth who you feel is still here for you today, as you’ve matured? NICK LOWE: Ah, that’s a great question. Well, Otis Redding comes to mind. Sam Cooke. And Merle Haggard, he’s always, always there. Indeed, that was way cool! Sheezus, great stuff! No fooling, those were some great, cliche’-shattering questions. Hope you’re proud! I love that when asked about favorite memories from the Stiff era he mentions two that weren’t even his songs. I can only imagine how magical both of those moments would have been. And indeed “there’s much worse stuff than Pink Floyd”. Yes, this is a great interview. A real music fan interviewing a real music fan. Sadly don’t see that enough in the magazine rack these days. A great benchmark for RTH too but, really, can we get back to more important stuff now? Like Joe Walsh being sober? This just in; James Gang and Eagles guitarist Joe Walsh is still sober. Great job — he’s one of my favorites and seems like a good guy too. A buddy of mine in Mpls. recently spent some time with Nick and reported that he was very gracious. Great stuff, KingEd! Over the course of (roughly) the last 34 years, I don’t think I’ve ever come across a Nick Lowe interview I didn’t like. That said, you really did ask some excellent questions! Thanks, KingEd. 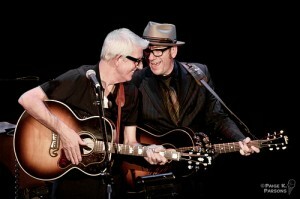 Although I’ve known of Nick Lowe and saw him open for Elvis back in 89 or so, I don’t know much of his music. This interview, along with most of the stuff that surfaces here, gets me to listen to new things. Ed and I are seated in the front row for tonight’s show! I really enjoyed reading that. Nice interview, KingEd. I was at the Spectacle taping that is mentioned in the interview. Nick told a funny story of how he presented “The Beast in Me” to Johnny Cash. Levon had just had surgery on his throat (I think), so he couldn’t sing or even talk. He sure could play drums, though!